Now he drinks from the living water of the well above. In the olden days there was a very wealthy woman who feared God and her name was Juliana. At a young age she became a widow with two orphaned infants, whose names were John and Themistia. * Because at that time the pagan emperors issued an edict and order for Christians who revered Christ to be punished, the widow became afraid, so she took her two children and went to a house, where she hid and raised her children in the education and admonition of the Lord. Her son John, when the time came for prayer, would leave his mother and go to the church, and after praying there in hiding, he would return to his mother. At that time all the Christians hid for fear of the idolaters. Once John went to the church to pray as was his habit, and he was found there by a God-loving Christian, who advised him that it was better to go and pray on the mountain rather than the church, since by going there he was in danger of falling into the hands of the idolaters. John listened to this advice, and said to his mother: "My mother, a God-loving Christian told me to go to the mountain, but I determined it was proper to ask for your blessing before I go." His mother allowed him to go, thinking that he would soon return. John bid farewell to his mother and sister, and he went to the desert to an Egyptian monk, whose name was Pharmuthius, and receiving his blessing he went deeper into the desert. There he found a dry well, full of scorpions, snakes and other reptiles. After he prayed, he cast himself into the dry well. As he was going down the well, as Angel of the Lord received him, and this is how he remained protected and unharmed. The well was twenty cubits deep. Having descended there, the renowned one stretched out his arms in the form of a cross, and he stood in prayer for forty days, without eating, without drinking, without sleeping, and without lowering his arms. With this the beasts and reptiles departed immediately, and an Angel of the Lord, who brought food daily to the above-mentioned Pharmuthius, the same would bring bread to John. While John was young at age, the Angel would not bring him food, lest he fall into pride, but it was brought to Pharmuthius, and he would say to him: "Behold the Lord has sent you this bread, that you may bring it to Abba John who can be found in the dry well." John received the bread from Pharmuthius, thanked God and ate it. He therefore glorified God, and daily received food from the elder for a few years. The devil, unable to withstand the great struggles of John, took the form of a servant of the Saint. And he went in the form of a servant to the elder Pharmuthius, and he deceived him with his words. Taking him therefore, he brought him to the mouth of the dry well, and he began to advise John that which he should not have. John understood this wile of the devil, so he set right the elder, and put the devil to shame, and he sent both away without he himself being harmed in any way. After this the devil gathered numerous demons, and he changed their form into that of the mother and sister of John, as well as friends, relatives, servants, workers and other acquaintances. They all went to the mouth of the well and began to lament and cry, begging him to come out so they may see him, or at least for him to speak with them. The Saint prayed below and did not speak to them at all, causing the demons to disappear. When the Saint had passed ten years in the dry well, and accomplished every ascetic exercise and virtue, and was legitimately well-pleasing to God, then a monk named Chrysios,** who had lived in the desert for thirty years, was led by a divine Angel to go and bury the Saint. 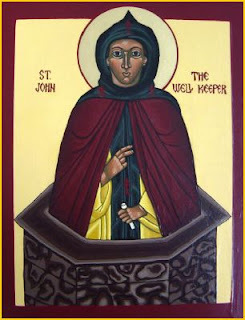 Standing for three days above the well, he put John to an oath by the power of God, to not hide any of his virtues, but to manifest them, that he may appear excellent to God. Then a miracle took place, which will astound all listeners. The floor of the well was lifted twenty cubits to the level of the ground, where the two Saints met and greeted each other. Since it was not right to annul the oath Chrysios made to John, John therefore narrated the story of his life and his accomplishments. Then after he embraced Chrysios with a holy kiss of friendship, and bid farewell, he departed to the Lord. Chrysios made a grave and buried the relic of Saint John with his outer garment over him, and the stone which covered the mouth of the well he placed over the grave. After reading the appropriate psalms, he planted a palm tree there, which - O the miracle! - immediately took root and flourished and became a perfect tree, and immediately it bloomed and became full of fruit. Chrysios saw this amazing thing and thanked God, saying: "Glory to You O Lord, for You know how to glorify those who love and glorify You, and make them inheritors of Your Kingdom." As Chrysios took account of these things, he prayed, and was taken by the Spirit of the Lord to the place where he lived in quietude. There he invited a pious and experienced man, and asked him to write all those things he had seen and heard. * It is said that John was from Kybistra (now Eregli) in Central Asia Minor. At the age of thirteen he departed on a one day journey where he found a well. ** Chrysios is said to have lived as an ascetic in nearby Barata.